On Saturday, 28.02.15 Pyramid Peak & the well known German author Wolfgang Brunner will present a unique and fascinating project in the Gueterhallen in Solingen/Germany. 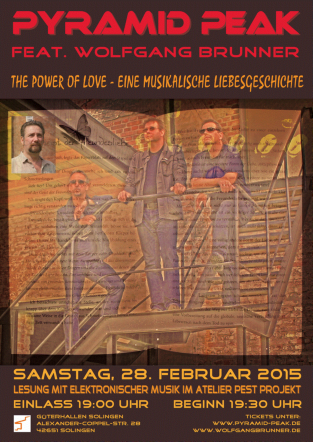 “The Power Of Love´- Eine musikalische Liebesgeschichte” will be the title of their first common concert. Electronic Music meets Literature! Wolfgang will read parts of his book “Der Schmetterlingsmann” (The butterfly man) and Pyramid Peak will create their sequencer- based soundscapes in between and during each part of the reading. Various light effects and the cultural atmosphere of the artist's workshop in the Gueterhallen in Solingen / Germany will make this event a unique and fascinating highlight of this years EM scene. Of course Pyramid Peak will play some additional songs at the end of the reading so that the visitors can enjoy an evening full of nice music and interesting literature. As special guest we are pleased to announce that Maxxess will join Pyramid Peak on stage again! So you can expect a really nice show with lots of great tunes and colourful visuals.